← There’s Always Next Year: But Who will be Saying it? Tuesday night I posted an article about the KKK endorsing Donald Trump. For a long time Trump has courted the vote of White Supremacists, and his staff and advisors include a good number of men with long ties to White Supremacist and other Alt-Right groups. The campaign refused the endorsement, but what is troubling is that that there is little condemnation of the endorsement by GOP leaders, nor of Trump’s tremendous racial baggage. 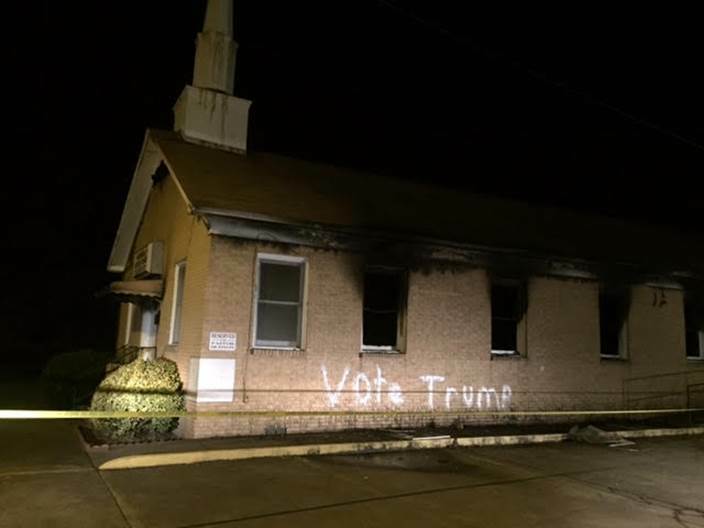 But even more disturbing in the day since the KKK endorsed Trump an African American Baptist church was burned and marked with “Vote Trump.” Last night a man who has a record of provoking violence against blacks executed two white police officers in Iowa, just a couple of week after being escorted from a high school football game for displaying the Confederate flag during the national anthem in front of a group of black students and parents. I am sure that we will learn a lot more about him soon. There are increasing numbers of threats being directed against blacks, immigrants, Jews, Muslims and liberals by people in the Alt-Right. Trump’s candidacy and the closeness of the race seem to have given them a green light to come out of the shadows. I do fear that we are going to see a lot more of these type of incidents in the coming days and weeks regardless of who wins the election. Since I have received threats from White Supremacists for years, including death threats, I do take this seriously and a bit personally. I hope and pray for the best, but I have a sense of dread about what is going on in the country. Intimidation of the citizenry. All this anger, created and endlessly fed by the fantasy rhetoric of the conservative media machine. And now this monster is beginning to show signs of self-awareness?!! The ball caps may have been manufactured in republican red. But, it seems that the slogan emblazoned on those hats was read by all-too-many as, “MAKE AMERICA WHITE AGAIN”. It definitely looks like the nationalist, white supremacist genie has been let out of the bottle. I seriously hope and pray that nothing else gets damaged or wrecked while this thing runs amok. Crazy seems to be the new order of the day! And, some genuinely frightening people seem to only see opportunities to violently act out these days. Be strong America. Believe and work for the dream of democracy and freedom for everyone. It looks like some very tough times are ahead of us. I am not a Trump supporter and I certainly hope he doesn’t win the election, but I see an opportunity for him to vastly improve his lot with the African-American community and the electorate in general. Imagine if Trump went to that church, condemned the attack in a press conference and then, in front of the assembled press, gave the congregation a check to pay for the restoration costs – not part, but all of the costs. Of course, he wouldn’t do it, it’s not in his makeup. Like other opportunities that he has allowed to pass, he wouldn’t be able to bring self to do such a thing, thank God. But he has cultivated the support of the Alt-Right from the beginning. Whether he backs off or not he has given the the green light. Even if he loses they are not going underground. That is what you should think about. Plus, his history over decades of business dealings show that his proclamation of being for African Americans is a ploy for the election and the election only. You can disagree but a leopard doesn’t change his spots.